Baby Face D. I. Y. This is a brand new section which will feature Baby Face Do It Yourself instructions and tutorials on a vairiety of subjects. Our very fist tutorial is a fantastic Photography lesson by an accomplished photographer and also avid Baby Face collector, Ms Pamela from the Baby Face Workshop. I tried to get her to come to my house and take pictures for me for the website, but she lives in the Netherlands and New York was a bit far for her to come. Instead, her tutorial has helped me and I will be using the tips to improve my photography technique. You will see the results in the coming weeks, as I replace all the old photos on the site, with new ones. Here is an example of how Pamela's tips have helped me to improve a picture of my Baby Face Hostess. 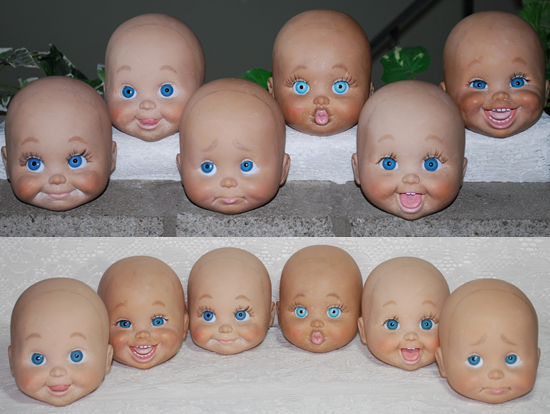 And as second example, here is a photo of my original Baby Face prototype sculpy heads. Improvements in background and most of all LIGHTING is what makes the difference in these photos. 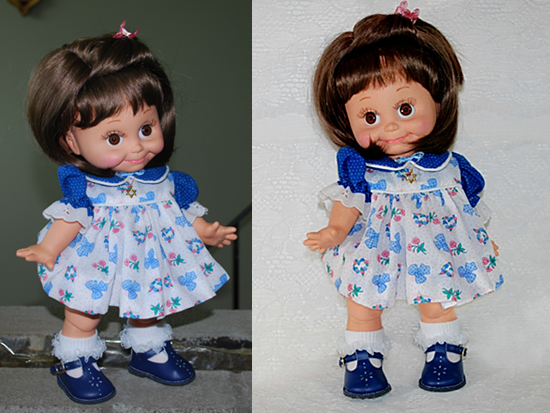 Ms Pamela tells you how to get started, on the road to better photographs of your dolls. in her Photography Tutorial. Other subjects we will be covering in the future are Sewing for your Baby Face, tips on Restoration, Customization and more.